Oh boy, oh boy… carb cycling vs carb ups! This outta be interesting (ps. it really is). The keto diet can be a bit complicated, with keeping track of your macros, testing your blood sugar, and so on. And then once you get more into keto, you come across intermittent fasting, carb ups, and more. Why Do Carb Ups On A Keto Diet? What Can You Eat During A Carb Up? Carb cycling is a relatively new dietary approach. The idea is that you alternate your carb intake a daily, weekly, or monthly basis. The aim of carb cycling is to exclude carbohydrates when they are not needed, and then to add them in when it will provide maximum benefit. Commonly, carb cycling is used for maintaining physical performance, fat loss, or overcoming a weight-loss plateau. Typically, someone following carb-cycling may have three low-carb days, two moderate-carb days, and then two high-carb days. Carb cycling is used in conjunction with other dietary approaches, but not specifically keto. Carb ups are also known as ‘cyclical ketosis’. 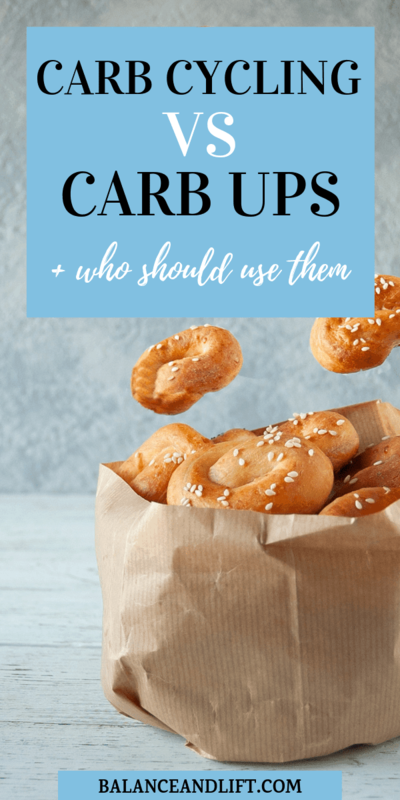 If you are following the keto diet and want to try out a more advanced strategy, then you can look to include carb ups in your diet. A carb up is when you intentionally consume more carbs than usual for a period of time – anywhere from one meal to two days. But most often it is for a period of one day. It will kick you out of ketosis – but that is the point! Cycling ketosis is suitable if you have been following the keto diet for some time, and have a regular workout routine in place. It is not (in capital letters NOT) recommended for beginners, or for those who do very light (or no) physical activity. 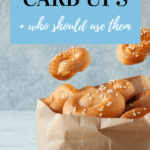 There are few reasons for doing carb ups on a keto diet. You can use it to improve hormonal imbalances, break a weight-loss plateau, enhance muscle growth, increase your energy expenditure, and also improve leptin concentration. To get the full benefits of doing a carb up, you need to do it in a very controlled manner. You’ll also need a lot of discipline to make sure you get right back to keto after your carb up, so your carb up day doesn’t become a carb up month! Before you begin to add carb ups to your diet, you need to ensure that you are already fat adapted – i.e. your body is using fat as its primary fuel source. For most people, this will happen after around 4-6 weeks into the ketogenic diet. I recommend waiting a little longer than that before trying to do a carb up, to give you enough time to also let the keto diet become more of a habit and a ‘way of life’. The reason I recommend this is because increasing your carbs for that short period of time may trigger your carb cravings, which could make it very difficult to cut back again. It is therefore important that you are in the right headspace before trying this strategy. You might notice slight weight gain – this will be water weight, so don’t stress! There are many different ways of doing a carb up / cyclical ketosis. Below are examples that can be used for bodybuilders and those who want to achieve maximum muscle growth, and examples that work well for ‘normal’ keto dieters. 1) Eat keto the whole week, with one carb up meal each on Thursday and Sunday. 3) Eat keto for 12 days, and do a carb up over the weekend. 1) Eat keto from Monday to Friday. Do a carb up on Saturday, and be back at doing keto by Sunday evening. 2) Eat keto from Monday to Friday, and do a carb up over the whole weekend. As I mentioned earlier – it is best for those who have a solid exercise routine. This is because you will need to deplete your glycogen fully before your carb up, to get the best results. Doing your carb up the day after a heavy workout will be ideal. For your first day back on keto, start your morning with a workout, and follow a strict keto diet with around 0-2% carbs. On the second day, you can return to a normal keto diet with 3-5% carbs. It is important to listen to your body when doing carb ups – especially in the beginning stages. Not all approaches will work for everyone. You may find that you need to workout for at least two days in a row after going back to keto, or that you can only manage one carb up meal instead of a whole weekend, or that once a month works best for you. Keep testing and monitoring, and you will find an approach that works for you. A carb up is not an excuse to have a ‘cheat day’. Keto does not work well with cheat days at all. Carb ups don’t include donuts, potato crisps, and candy bars. Having these foods can lead to unhealthy increases in insulin, blood sugar, and inflammation in the body. They will also cause your body to store extra fat. Instead, you will be including healthy complex carbohydrates (mostly high-carb vegetables) such as sweet potato, carrots, black beans, apples, bananas, oats, whole wheat pasta, and quinoa. If you are only incorporating one carb up meal, then I recommend having it at the end of the day, so you can sleep away the side effects and cravings that you will very likely experience. Complex carbohydrates take longer to digest, which leads to a steady increase in blood sugar, and no unhealthy increases in insulin. Shredded pork, broccoli, and some steamed white rice. Ground beef lettuce wrap with plantain chips, sweet potato chips, or carrot chips on the side. And for dessert – a side of fruit or a small fruit salad.